Rob sent me the following link this morning on a curiously stubborn geocentric view. The video uses Flat Earth science to make a general point about competing views that fit the same data points, so it’s timely for our exploration of the Precambrian Conspiracy (summarized here). My friend Michael Davis, my former coworker at Wizards of the Coast, got into a protracted online debate with the Flat-Earther crowd, and decided ultimately that their public argument was performance art. When he asked them if this was the case, they were tellingly silent. While Rob was discovering this video, it occurred to me that I should look at new ways the Conspiracy might be interpreted, just to be thorough. It’s possible that non-rational magic and not dependable scientific laws ultimately govern the universe and explain all the observed phenomena of life and the Conspiracy. While the Ancient Singularity hypothesis might explain Middle-earth or Melniboné, that explanation would be unsatisfying — at least to me. Magic and myth cosmologies have a different tone from science-based ones, so to do justice to fantasy, we might consider a different perspective. Maybe Abraxas is something closer to the avatar of a demigod, or to a demon. In my gamer novel posted on this blog, Steve’s rpg world exists in a universe where the spacetime fabric is like the shifting weather of earth, and even when all seems quiet, there are subspace storms raging at a level we can’t see, insulating our region of the universe from the demons and angels who can normally step from world to world. In such a universe, the Disinformation would mark a periodic lull, allowing these entities to come through. During previous times, they spirited away primitive creatures like dinosaurs and prehumans, rescuing them from the extinction they faced on earth. And elsewhere in the universe they go on, following their own evolutionary paths. Non-rational magic could hold sway on those worlds, and it may come to visit us from time to time, and have persistent oases, as described in the books of J.K. Rowling, or persistent conduits like the doors to Narnia or to Lev Grossman’s Fillory. I will keep this perspective in reserve. In any case, note that there are four prime orientations of speculative cosmology, along two axes. The axes’ cardinal points are magic, science, human-relevant, and human-irrelevant. 1. Non-rational magic that nonetheless is humanistic, because humans carry within them the essential divine or magic spark of the universe. Tolkien and C.S. Lewis heavily mine this seam. 2. Non-rational magic that is not humanistic, where we are but pawns of the gods, if they aren’t indifferent to us altogether. Maybe this is where Elric lives. 3. Rational science that is not humanistic because we evolved in a very provincial context, and just don’t have the neural equipment to tackle a universe fraught with paradox and pierced by multiple dimensions. Lovecraftian horror presents this cosmology. 4. Rational science that is humanistic, because though we evolved in a provincial context, we are capable of universally valid deductions, though science is still very tough. This appears to be the orientation of the Precambrian Conspiracy. These orientations are not pure, and all speculative worlds fall on different positions within the range of the four cardinal points. This entry was posted in Fantasy, Games, Precambrian Conspiracy, Writing and tagged Precambrian Conspiracy. Bookmark the permalink. 2 Responses to What World Do You Live In? There was a SF book many years ago called “the Practice Effect” where (as I recall) practicing literally did make perfect. I forget the details, but either first time carpenters would make crappy houses but as they got better the houses would be better… no duh, but… maybe in a wood becomes metal sort of way OR if you just keep “working” the house it gets better… so a house that’s one day old is crappy but one that’s years old and has been “worked” is a palace. Of course, I’d call this “rational magic” but then “rational magic” is merely science that we haven’t figured out the laws for just yet. Then there was a Scientific American article a few years back that posited with a few more billion years of cosmic expansion, humans in that future era might not be able to see enough of the universe to be able to deduce the Big Bang Theory. An odd but interesting concept, what I’m gonna guess fits in with your non-humanistic rational science quadrant. But in this case I’d quibble with “non-humanistic” and replace it with something akin to “not humanly know able” and this SciAm article would be at the extreme end of that into the full on “unknowable”. Thanks for the comment, Mike. Knowable versus unknowable is a potential axis, but even if something is unknowable because of lack of data, that doesn’t mean that the universe itself is ultimately incompatible with human logic. I’d still put the SciAm article in the rational, humanistic quadrant. The Cthulhu Mythos is about a universe that is fundamentally beyond us. We will never understand the Great Old Ones, and it’s folly to try. Our science is valid only from our very limited, local framework, and what’s outside that has no use for us at all, except perhaps as some kind of food. Along roughly the same lines, say that the universe is just a simulation with an abstraction layer, like a virtual machine, and that the real physical laws are other than the ones we observe. That setup is not necessarily anti-humanistic like the Mythos. We still may have relevance to the universe enfolding our universe, and our logic may still apply. Or not, of course. Rational magic would lie at 0 on the Science vs. Magic axis, unless the book made it clear that it should be taken to be either magic or not. I’ve been thinking about Dune. 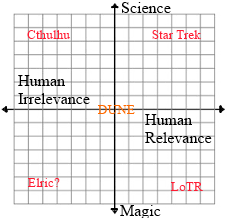 I’d say Dune lies at the very center of the graph, at the origin.